This listing is for the set of dolls in the top photo. The two taller dolls are just under three inches high. All four are dressed in hand stitched merino wool felt clothing over striped stockings. In the waldorf tradition, the facial features and expression are left to the imagination of the child. Their bodies are bendy and able to take on different poses. Acorn cap dolls are sturdy and intended for play, however they are not suitable for children under age three or any child who still mouths toys. 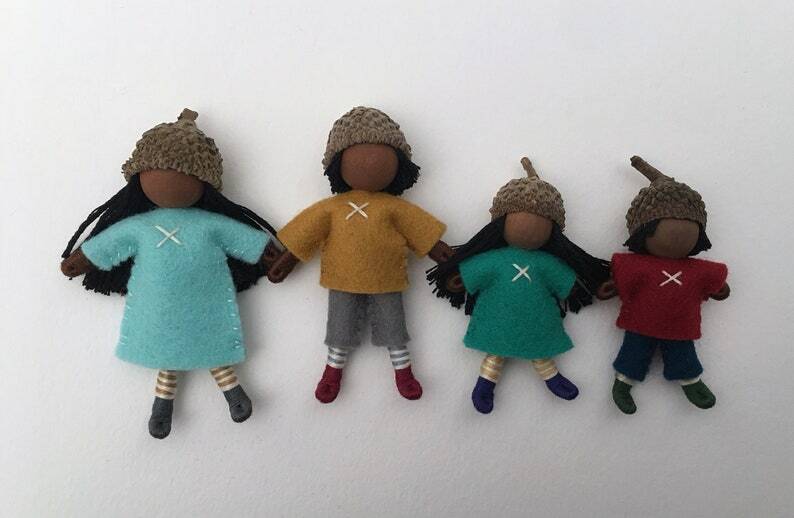 Many of the techniques for making these dolls can be found in the wonderful book "Felt Wee Folk: Enchanting Projects" by Salley Mavor. Thank you for visiting Dream Child Studio and have a wonderful day!